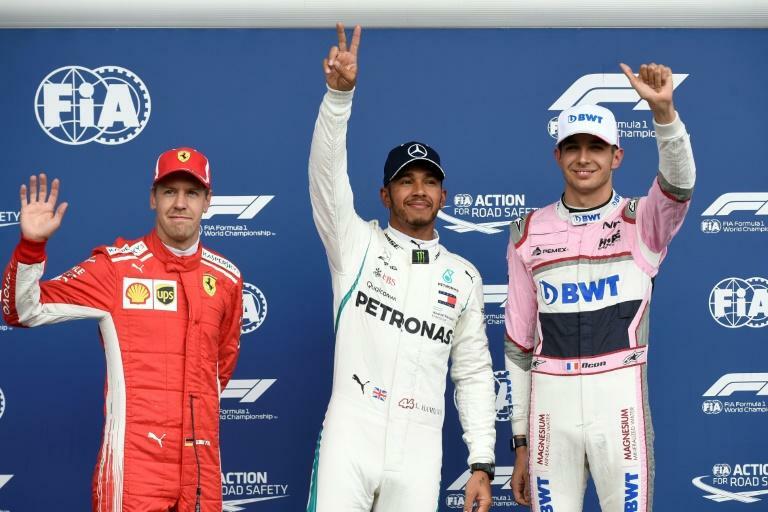 Lewis Hamilton and Sebastian Vettel spoke out for Esteban Ocon Saturday after the young French driver, who faces losing his job, qualified third for Force India in the Belgian Grand Prix. The Mercedes and Ferrari drivers said Ocon had shown the talent to deserve his place in Formula One, Hamilton adding that his predicament was a symptom of a wider malaise in the sport. The two four-time champions hit out amid widespread expectations that the impressive Mercedes junior driver will be replaced at Force India by Canadian Lance Stroll, the son of the team’s new owner, billionaire Lawrence Stroll. Stroll is under contract to drive for Williams this year, but is reported to be preparing for a seat-fitting with Force India in anticipation of switching teams before next weekend’s Italian Grand Prix at Monza. "I've always been a supporter of Esteban,” said Hamilton who took pole with Vettel in second ahead of the impressive Ocon. Speaking at the post-qualifying news conference, Hamilton went on to add: “Unfortunately, we're in a weird place in Formula One where some teams, rather than take the up-and-coming kid, they take the money. "It means the structure of the sport is probably wrong, in terms of how the funds are distributed. "I've not read who has signed where and what seats are available, but he needs to be in a top car as he is one of the top drivers here. Vettel, who is 24 points behind Hamilton in the title race, praised Ocon for his driving and said his qualifying performance "should be considered for signing him somewhere next year. "It's very good to get this qualifying session under the belt and get the car in P3, where it doesn't belong,” he said. After Saturday’s session, Ocon was caught by cameras talking to Vettel and telling him that he would not be staying at the re-born Force India team because one seat was taken "by the one who bought it" and the other was to be taken by "the other one, who brings the money". He was clearly referring to Stroll and Mexican Sergio Perez, who took fourth place in qualifying to confirm that Force India, in their first event as a new mid-season entry, would start Sunday’s race with both cars on the second row of the grid. Ocon was delighted to hear the two drivers, who are fighting for a fifth title, lend him such strong support. "It’s awesome to hear that. I’m very happy to hear that,” he said. "Of course, I want to be racing next year, and I’m doing everything for it, I’m working very hard every day for it. "To hear great things from those two champions is just fantastic. I will see what the future is going to bring. "I’m managed by Mercedes and they’ve taken great decisions for me in the past so I’m sure it will be the same again for me in the future, hopefully, and I will be sorted out."